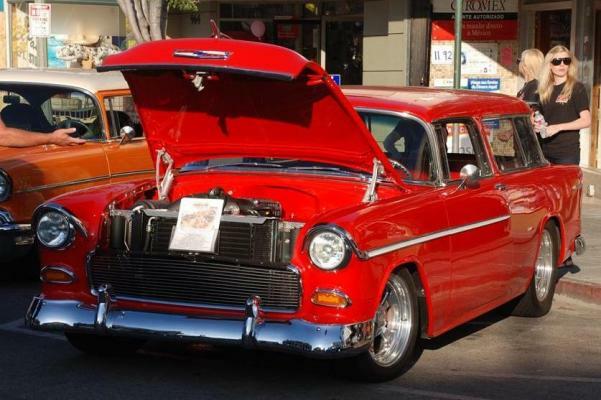 This is Mike's 55 Nomad. Super clean and super fast! Rides on an Art Morrison Chassis we installed. Features a blown LS2 with a Magnuson Supercharger. Has L92 rectangular heads. Made 640 HP backed by a 4L80E transmission. Also features a Precision Industries 2500 Stall Converter. The chassis was upgraded with CPP 13 inch brake kit. It rides on 17 inch Budnik wheels. We also outfitted a custom aluminum fuel tank. Has Vintage Air climate control, new Dakota Digital VHX Dash, and custom leather interior. Features Bones Fab custom front drive on engine. Also has custom carbon fiber coil overs.